Increased collaboration between architects and building officials prior to and during the permit process can lead to great savings in time and money. 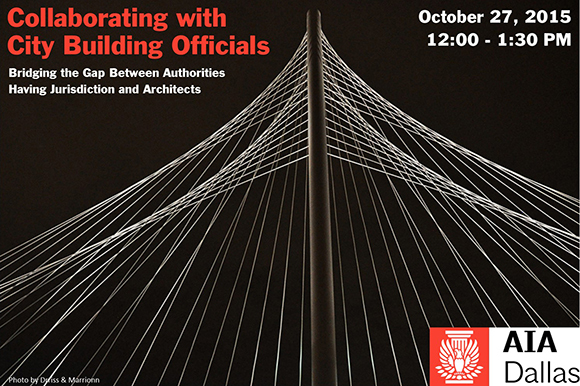 The Codes & Standards Committee of AIA Dallas will host a panel discussion to discuss how architects can work with their city's building officials to create a smooth permitting process. Let us know what questions you might have and we'll incorporate them into the discussion for Tuesday, October 27th. This event is designed to assist in bridging the gap between Architects and Authorities Having Jurisdiction (AHJ) in reference to building code reviews required by municipalities issuing Building Construction permits. Building officials will give a brief summary of their jurisdiction’s permitting process and provide valuable information for those attempting to navigate the permitting processes in Dallas, Irving, and Plano. In addition to offering you the opportunity to ask your questions regarding the permit process, information will be provided on how architects can collaborate with city officials in the programing and schematic stages of design to reduce costly design changes. Sign up to attend this discussion and feel free to submit any questions that you might have for the panelists through the comments section.